Left: American-born Canadian social and urban activist & author Jane Jacobs (1916 – 2006) in Washington Square Park, New York, New York, August 24, 1963. Photo by Fred W. McDarrah/Getty Images. Fans of the new Amazon Prime series The Marvelous Mrs. Maisel about a young, rookie stand-up comedienne in 1950’s New York City will have caught a glimpse of Jane Jacobs – the Jane of Jane’s Walk fame – in the show’s 4th episode when Midge stumbles into a rally in Washington Square Park. She arrives just in time to catch Jacobs giving a powerful speech about the importance of human-centric urban planning and is transfixed equally by Jacobs’ powerful message as much as her ability to capture the crowd’s imagination. While based on real historical events, it’s obviously it’s a moment crafted for TV. But it still leaves us wondering: who was this enigmatic figure and why did the writers want to introduce her to a new generation? 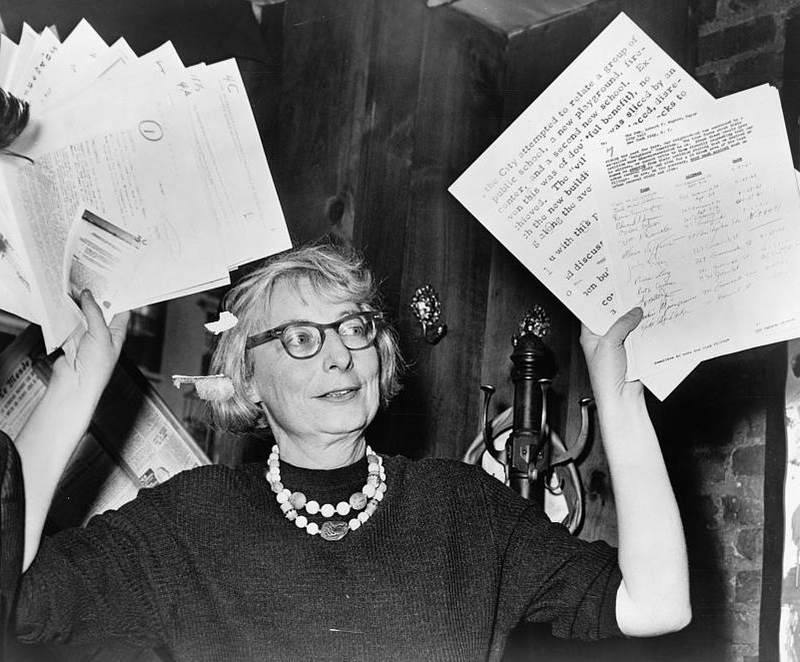 Born in Scranton, Pennsylvania, Jane Jacobs started her career as a journalist and freelance writer. Though she didn’t have any formal training in the field, she developed an interest in urban planning while living in New York City’s Greenwich Village, and went on to become an urban activist – arguing against gentrification, car-centric urban design, and suburban sprawl, and championing community-based approaches to city building. In 1961 she published a book called The Death and Life of Great American Cities that laid out her philosophies and went on to become one of the most influential pieces of writing on urban design, as well as coining the concepts of “social capital” and “mixed primary uses”, which are now widely used terms in the field. She moved to Toronto in 1968 where she continued to be an activist and prominent figure on matters of urban planning until her death in 2006. In 1996 she was selected as an officer of the Order of Canada for her contributions to urban environmental design and sociology. 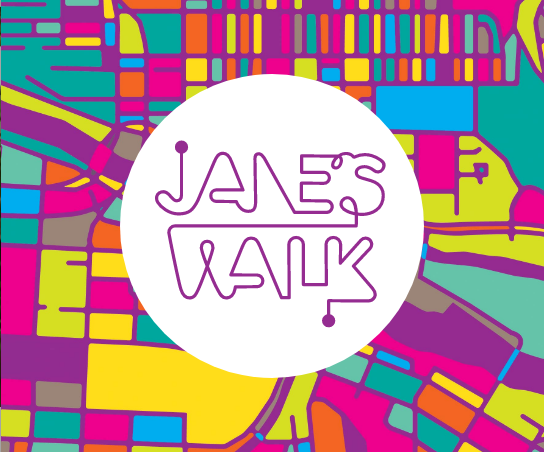 Jane’s Walk was founded in 2006 by a group of Jane Jacobs’ friends and colleagues as a way to honour and activate her ideas. The first year, they organized 7 walks in Toronto that explored various neighbourhoods, led by guides with a specific area of interest or expertise about a public space. Over the next 10 years, the movement saw rapid global uptake. In 2017, 1,700 Jane’s Walks took place in 225 cities around the world, spanning 37 countries and 6 continents. Organized by The Calgary Foundation, Calgary has participated in the global event since 2008 and has seen up to 82 walks in one year. Walk hosts plan their tours around relevant topics, which can be about anything from public art to skateboarding to urban wildlife watching. The 2018 edition of Jane’s Walk Calgary is taking place on May 4, 5 and 6 – at various locations around the city. All events are completely free and open to the public. A central gathering spot since Calgary’s early days – and on land where Indigenous peoples have been gathering for longer still – Stephen Avenue bears quiet witness to the lives of its citizens. 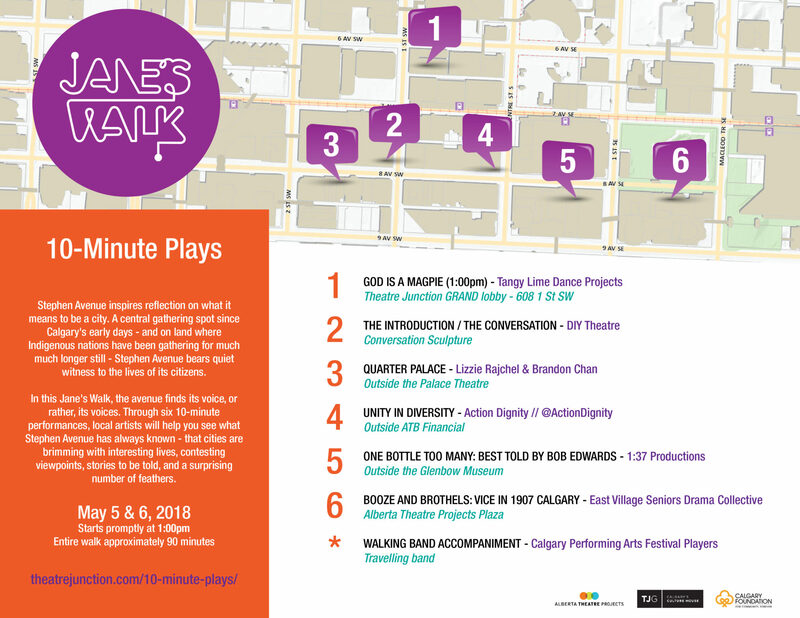 In this Jane’s Walk, ATP and Theatre Junction Grand have joined forces to bring you stories inspired by the avenue’s history through six, 10-minute performances by local artists. Audience: Please note that not all topics are suitable for children. No dogs, please.